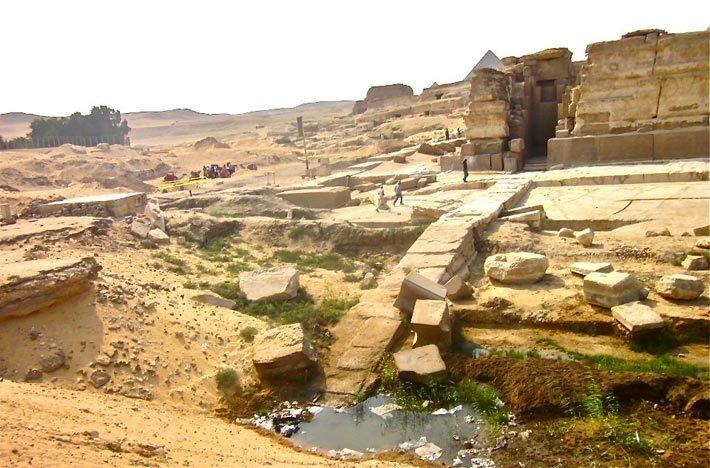 The Egyptian geologists located a possible harbor at the foot of the Sphinx temple and Khafra valley temple in 1978. In1994 the digs were showing first: a section of a huge wall 231 feet long and 10 feet wide that was part of a huge retaining wall that channeled Nile water into a harbor in front of sphinx temple. Archaeologists long have assumed that a harbor would have been essential for the pyramid builders to have transported stone blocks to Giza plateau. In 1980,1992,1994, excavations in front of the sphinx proved the existence of an harbor. It might indicate the edge of an Old Kingdom harbor and quay with evidence of large piers and artificial water basin.They found also that the 3 main pyramids had seperate harbors each one. In 2010 tey discovered a lot of other stones and sections of walls that are part of the harbor. The Works will continue but ground water is making diggs difficult and a lot of pumping is needed. It's a long and huge work ! All these discoveries are reinforcing my own work and theory about the "Divine Island of Giza" I show in my lectures.